Celebrating its 25th year, Christmas Tree Elegance is more festive than ever. 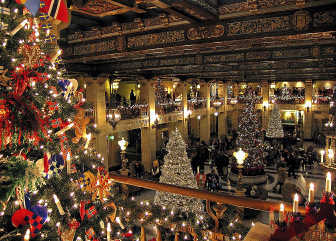 With 12 beautifully decorated and lavishly accessorized trees, and two full weeks for viewing, there’s something for everyone at the Davenport Hotel this year. Christmas Tree Elegance is the major fundraiser for the Spokane Symphony. The event is organized by Symphony Associates throughout Spokane County, and hundreds of volunteers join in the project. Committed men and women donate more than 100,000 hours each year. Each tree has a team of coordinators, procurers and decorators. Co-chairing this year’s event are Barbara MacAfee and Maureen Boutz. Hanley and her team chose a black Christmas tree to fit her Silver Screen theme. “It’s fun to design a wonderful tree,” Hanley says. The 12 trees, each valued at just less than $5,000, are outfitted with gifts, cash and gift certificates. Some include trips to locations as varied as Italy, Las Vegas, Scotland and the Caribbean, and a ski package to British Columbia. The winning raffle tickets will be drawn on Dec. 8 at the Davenport Hotel.